What the Heck is Jimaca? Jimaca is a root vegetable originally grown in Mexico also known as Mexican turnip and yam bean. Its outer bark-like thick skin needs to be peeled to enjoy the juicy, crunchy and slightly sweet and nutty tasting interior. The preferred way to eat the inside is raw (e.g., cut into slices or sticks for salads and side dishes), however it can also be cooked (e.g., sautéed or roasted). Curious, let’s explore what the heck is jimaca. One cup of jimaca has 44% of the recommended daily intake of vitamin C, 12 grams of carbohydrates, 6 grams of fibre and only 49 calories. It also contains important antioxidants including vitamin E and beta-carotene. Plus a small amount of the minerals folate, potassium and magnesium. More human trials are needed to substantiate the assumed health benefits of jimaca and its nutrients vitamin C, fibre and antioxidants. Here’s some of the research to date. In a 2016 randomized controlled trial published in the journal of BMC Complementary and Alternative Medicine, 30 healthy volunteers (aged 20-45) agreed to consume 500mL of either: 1) jicama juice, 2) guava fruit juice or 3) water (1). The volunteers fasted for at least 12 hours prior, The following measurements were observed at 4 identified times throughout the 12 hours: a) heart rate; b) systolic/ diastolic blood pressure, and c) biochemical parameters (nitrate concentrations, serum potassium concentrations). Platelet function was measured twice in the 12 hour period. Reduced diastolic blood pressure was the only positive health benefit observed. It’s important to note nitrate concentrations increased rapidly (within 30 minutes of ingestion and up to 1.5 hours). The researchers state that a decreased production of nitric oxide is apparent in hypertension, and conditions associated with elevated blood pressure (e.g., diabetes, hypercholesterolemia) and consuming nitrate enriched foods can contribute to increase nitric oxide concentrations. 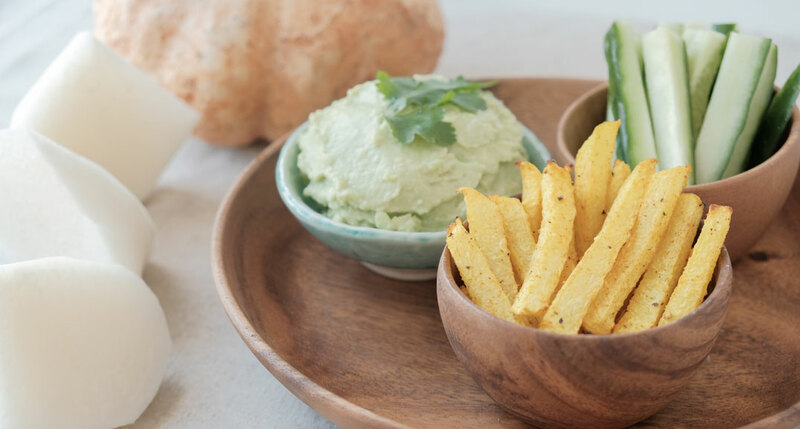 In a peer-reviewed animal study published in the Journal of Clinical Biochemistry and Nutrition in 2016, the potential effects of jicama on hyperglycemia and insulin sensitivity were explored (2). Male diabetic mice consumed either a regular diet (control; n=7), a diet supplemented with the anti-diabetic drug rosiglitazone (n=7) or a diet supplemented with jicama extract (treatment; n=7) for 6 weeks. The mice who were fed the jicama supplemented diet showed the following results compared to the control: 1) significantly lower blood glucose levels, after 2 weeks; 2) significantly lower HbA1c; 3) a decrease in plasma insulin levels; 4) an increase in insulin sensitivity, and 5) a lower homeostatic index of insulin resistance. Although promising results, this is an animal study which needs to be verified via human clinical trials. A 2015 peer-reviewed animal study published in the journal of Biology, Medicine and Natural Product Chemistry explored the effects of jicama on menopause (3). It categorized jimaca as a phytoestrogen because it naturally contains genistein and daidzein compounds, which have a chemical structure similar to estrogen. In the study, mice were randomly given one of the following doses of grated jicama: 0.3 g/kg, 0.6 g/kg and 0.9 g/kg for 24 days. The results of this study showed that there were changes in the ovarian follicles and uterine glands at all three doses of jicama. In fact, tertiary follicles developed with follicular fluid in the group who received 0.9 g/kg of jicama; thus, as a potential source of natural estrogen, jicama could: 1) increase the proliferation and maturation of ovarian follicles in the pre-menopausal period; and 2) increase proliferation of uterine endometrial glands of the uterus in the pre-menopausal period. Although promising results, this is an animal study which needs to be verified via human clinical trials. The only edible part of the jicama is the root. Therefore, it is highly recommended not to consume the leaves, outer thick skin, flowers and vines, as they contain the natural insecticide rotenone making those parts toxic. Remember, no single food or ingredient will instantaneously be a silver bullet for health and wellness. A lifestyle filled with healthy habits including a balanced dietary pattern, exercise and restful sleep is the best approach for long-term consistent health. about the latest food and nutrition trends. Click here to contact me. Park CJ, Lee H, Han J. Jicama (Pachyrhizus erosus) extract increases insulin sensitivity and regulates hepatic glucose in c57bl/ksj-db/db mice. Journal of Clinical Biochemistry and Nutrition. 2016; 58(1):56-63. New Year, Start Healthy. Brown Baggin’ it!